47 GOLDWATER ESTATES HILLSIDE VIEW LOT - OVER 3 ACRES 4040 East Keim Dr #3, Paradise Valley Now available - one of the Goldwater Estate lots on over three acres of gently sloping hillside. Fabulous non-stop views all around! Wonderful setting for your new residence with a gated entrance from Keim Drive. Plans for an elevated masterpiece with hillside views were created by Candelaria Design, showing a generous homesite. 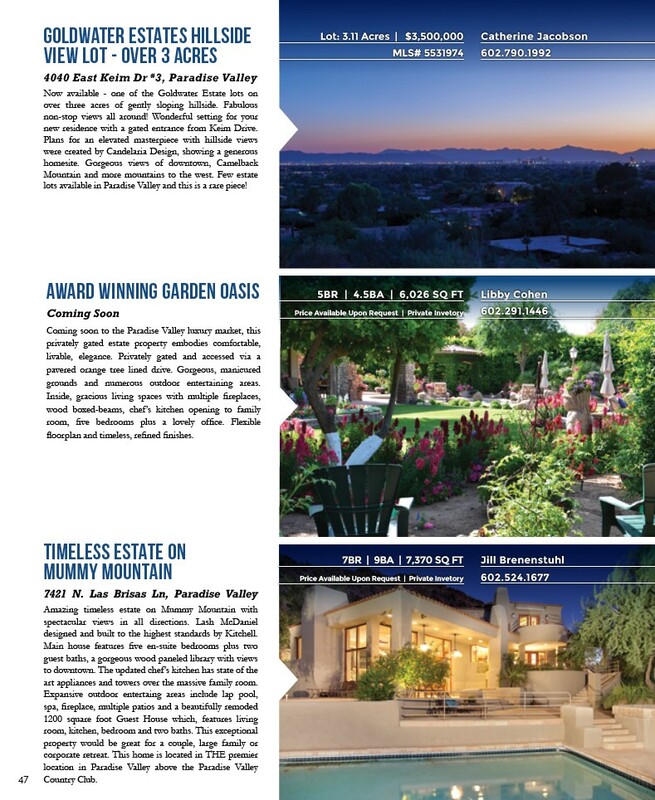 Gorgeous views of downtown, Camelback Mountain and more mountains to the west. Few estate lots available in Paradise Valley and this is a rare piece! TIMELESS ESTATE ON MUMMY MOUNTAIN 7421 N. Las Brisas Ln, Paradise Valley Amazing timeless estate on Mummy Mountain with spectacular views in all directions. Lash McDaniel designed and built to the highest standards by Kitchell. Main house features five en-suite bedrooms plus two guest baths, a gorgeous wood paneled library with views to downtown. The updated chef’s kitchen has state of the art appliances and towers over the massive family room. Expansive outdoor entertaing areas include lap pool, spa, fireplace, multiple patios and a beautifully remoded 1200 square foot Guest House which, features living room, kitchen, bedroom and two baths. This exceptional property would be great for a couple, large family or corporate retreat. This home is located in THE premier location in Paradise Valley above the Paradise Valley Country Club. Lot: 3.11 Acres | $3,500,000 MLS# 5531974 Catherine Jacobson 602.790.1992 5BR | 4.5BA | 6,026 SQ FT Price Available Upon Request | Private Invetory Libby Cohen 602.291.1446 7BR | 9BA | 7,370 SQ FT Price Available Upon Request | Private Invetory Jill Brenenstuhl 602.524.1677 AWARD WINNING GARDEN OASIS Coming Soon Coming soon to the Paradise Valley luxury market, this privately gated estate property embodies comfortable, livable, elegance. Privately gated and accessed via a pavered orange tree lined drive. Gorgeous, manicured grounds and numerous outdoor entertaining areas. Inside, gracious living spaces with multiple fireplaces, wood boxed-beams, chef’s kitchen opening to family room, five bedrooms plus a lovely office. Flexible floorplan and timeless, refined finishes.